Sorry Guys, I've been really lazy about updating the blog lately, but here's a little something from yesterday. Yesterday was my day off, so I spent the day sleeping in, cleaning my room, doing the laundry, internetting, and of course WATCHING THE SUMO! There were lots of great matches today, including a sweet fight between Asa and Kotomitsuki, but the one that really caught my eye was the match between Tamarikido (玉力道) and Kitazakura (北桜). You may or may not remember, (I'm putting my money on MAY NOT) but Kitazakura is the sumo I like to call 'The Human Salt-shaker', because of his awesome pre-match salt-throwing stlye. And as luck would have it, I was able to see his signature salting of the ring twice yesterday. The match got off to a bad start with a 'matta' (false start) by Kita and then turned into a pretty standard grapple-fest. As the match progressed Tama managed to manouever Kita almost out of the ring, until Kita pulled a sukui-nage on him right on the edge of the straw bales, causing them to fall out of the ring simultaneously. It looked to me like they fell at almost exactly the same time, and I would have been hard-pressed to decide the winner, but the ref found for Tamarikido. However the oyakatas agreed with me and hustled up onto the dohyo for a mono-ii (deliberation). They decided it was too close to call, and ordered a do-over. 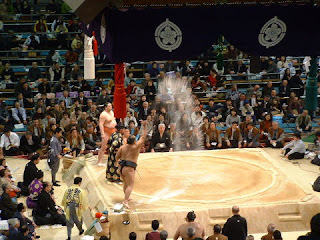 I think the sumos themselves must hate to have a do-over, but the upshot is that the fans got treated to Kitazakura's magnificent salt-shower twice in one day. Poor Kitazakura, I'm still rooting for you buddy! False Alarm: Where is the Baby?